The 2010 dodge ram 3500 mega cab electric vehicle qualifies for a federal tax credit of up to $7,500, effectively reducing the net base price. The 2010 Ram Heavy Duty is the best heavy-duty pickup ever. For now, anyway. Dodge is first out of the gate, but Ford and Chevy are prepping new versions of their own workhorses, to be unleashed in 2010, and then it'll again be a level playing field. Until then, Ram HD gets to play undisputed king in an important segment, as heavy-duty pickups account for about a third of the massive full-size truck market. At least until Ford and GM open the barn door on their new heavy duty trucks, the comfortable, capable 2010 Ram Heavy Duty will be the obvious choice for most objective shoppers. Let's face it: If you're a died-in-the-wool Ford man or GM guy, it hardly matters how good any new Dodge truck is. Beyond that, there isn't much not to like about the 2010 Ram Heavy Duty lineup. The 2010 Ram Heavy Duty isn't technically all-new, but it looks and acts the part. New sheetmetal, a new interior (both heavily derived from the new Ram 1500) and re-tuned underpinnings combine in a more stylish, more refined, more capable offensive lineman of a pickup. Also worth noting is that the trucks have earned their own brand, so now the Dodge Ram is just the Ram. We've driven a few versions the 2010 Ram Heavy Duty – we've done some towing, we've taken the Power Wagon off road – but the most revealing moments came when we drove, back to back, a 2010 Ram 2500 Crew Cab with the short bed and diesel engine and the equivalent Chevy Silverado. The Ram was notably quieter, smoother, more attractive and more refined than the Chevy. Although the Ram HD has to forego the rear coil springs that help make the Ram 1500 the most fun and most comfortable truck in its segment, the re-tuned suspension and fluid-filled hydro mounts at the rear of the cab do an impressive job of isolating the cabin from the road. How will the new Ram HD fare against the new Ford and Chevy heavy duties looming on the horizon? We'll have to wait and see. But Dodge has set the bar pretty high. It's not really a feature, but the 2010 Ram Heavy Duty's smooth ride is one of its key strengths, and one you can appreciate every mile. The 2010 Dodge Ram Power Wagon is an off-road beast. It's a Hemi-powered 2500 Crew Cab with electric-locking front and rear differentials, electronic disconnecting sway bar, Bilstein shocks, 32-inch tires, skid plates, 4.56 axle ratio for hill climbing and a 12,000 pound winch. The design and quality are good, but the best part about the 2010 Ram Heavy Duty's passenger cabin is the long list of available features that includes heated/ventilated front seats, heated rear seats, heated steering wheel, power adjustable pedals, memory seats/radio/mirror and more tech-centric features highlighted in the Optional Features section of this review. Crew Cab models have dual underfloor storage compartments, the Mega Cab has reclining rear seats, and they're all available with a monstrous center console that's big enough to hold a laptop computer and hanging files. The 2010 Ram Heavy Duty is available in three cab styles (Regular, Crew Cab and Mega Cab), two box sizes (6 feet 4 inches and 8 feet) plus single- and dual-rear-wheel configurations. The Ram HD is distinguished from the Ram 1500 by a notably larger grille and taller hood (with stamped louvers) and unique bumpers. We've seen pictures of the next Ford and Chevy heavy duties, and we think the Ram is the most stylish of the three. Standard feature highlights on a base-priced 2010 Ram Heavy Duty ST include air conditioning, tilt steering, six-speaker AM/FM/CD/MP3 audio system, plus front and side-curtain airbags. More basic features include things like manual windows/locks/mirrors, vinyl seats and black vinyl flooring. The 2010 Dodge Ram HD is as tech-savvy as it is tough, with an options list that includes navigation, Bluetooth phone connectivity, SIRIUS Backseat TV (offering Nickelodeon, Disney Channel and Cartoon Network), USB music connectivity, 30-gigabyte hard drive, 10-speaker surround sound, backup sensors and a backup camera (for easier trailer hook-ups). The Ram HD also offers an integrated trailer-brake controller for the first time. Dodge says 90 percent of Ram HD buyers choose the Cummins turbo diesel, which is standard on the 3500, offers a choice of six-speed auto or manual transmissions and includes the segment's only standard exhaust brake (we didn't get to properly evaluate the braking and stability advantages of the exhaust brake, but it sounded cool). 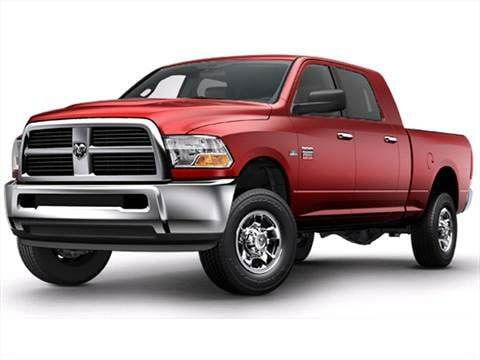 The 2010 Dodge Ram 2500 is tow-rated at 13,450 pounds and load-rated at 3,160, while the Ram 3500 checks in at 17,600 pounds and 5,130 pounds, respectively. The lineup also comprises two 4x4 transfer cases (a manual unit standard on 4X4 ST and Power Wagon, an electric unit on all others) and four available axle ratios: 3.42, 3.783, 4.10 or 4.56. The 5.7-liter HEMI V8 is offered only in conjunction with a five-speed manual transmission. The 2010 Ram HD starts at a Manufacturer's Suggested Retail Price (MSRP) of just over $28,000 and climbs all the way to around $60,000 when fully loaded. If what you need right now are a heavy duty truck and a good deal, check out the offers available on the outgoing Ford and GM heavy duties. But whatever you do, don't drive the new Ram HD - because then you'll know just how much you're missing. As for residuals, we expect the Dodge Ram HD to sit on the lower side of the spectrum, just below GM and significantly below Ford. Best pickup truck I have ever owned. No mechanical problems, mileage is 63,000, runs great and good gas mileage. KEEP IN MIND, ITS A TRUCK! 80,000 miles,Tires & Brakes Only !!! Normal Service plus tires and brakes.